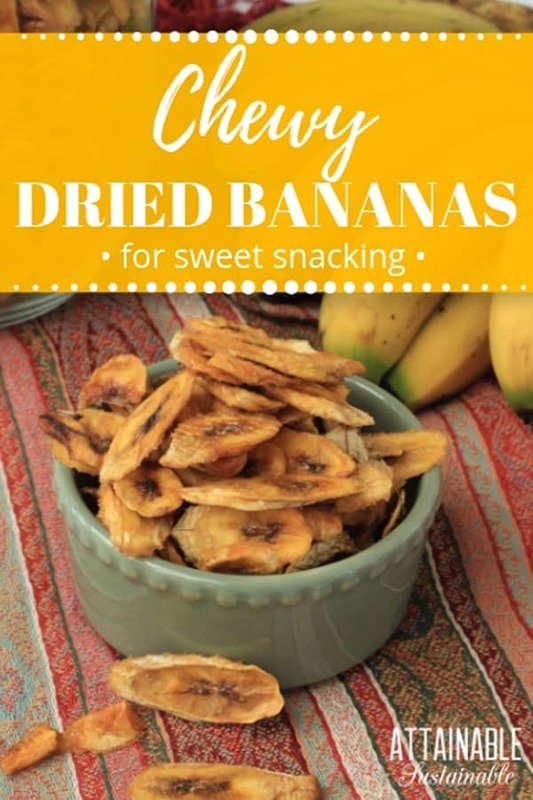 These chewy dried bananas are a great healthy snack and dehydrating bananas couldn’t be easier. Here’s how to dry bananas, transforming brown bananas into a sweet treat for your pantry or even your emergency supplies. Years ago, our landlady used to bring us dehydrated bananas when she had an abundance. Personally, I am a “fresh banana or no banana at all, thanks” girl, but my guys loved them. They were not the crunchy banana chips that are commonly sold in stores. These were chewy like Trader Joe’s banana chips. It took them no time to snarf down those healthy snacks. These days, we harvest 40-50 pounds of bananas at a time. There’s no way we can eat that many fresh bananas before they go bad, so dehydrating bananas makes sense. If you don’t have a banana crop like we do, keep your eyes open for overripe bananas on sale and use those to make these chewy dried bananas. They need to be sliceable, though. Save the really overripe bananas for this banana bread. Drying bananas at home — especially with sale-priced bananas — is much less expensive than buying the tiny packs for snacking. My landlady cut her dehydrated bananas lengthwise. I did it like that for awhile, but I found it tedious to cut them this way. It’s a lot easier to just slice the bananas across their length or on a diagonal. As you can see in the photo above, some end up round, others are cut a bit more on a diagonal. Truly, any of these ways work. Play around with it a bit to see what’s easiest for you when dehydrating bananas. There’s not really a rulebook on how to dehydrate bananas properly — we can be a bit flexible here! I coat the sliced bananas with fresh lemon juice. This can help prevent browning, but the lemon imparts a nice tangy flavor to the bananas. When I’ve skipped this step, there have been complaints. Your mileage may vary. If you’ve got an abundance of dried bananas in the pantry, chop some into this healthy waffle recipe! ★ Did you make these chewy dehydrated bananas? Don’t forget to give them a star rating below! 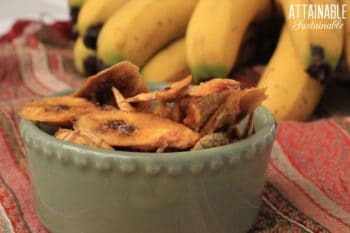 These chewy dehydrated bananas are a great healthy snack and they're easy to make. Transform brown bananas into chewy dried bananas for your pantry or emergency supplies. NOTE: For every five pounds of bananas, use 1/2 cup of lemon juice. It will take 20 or so pounds to fill a 9-tray dehydrator. Adjust the amount to suit your needs. 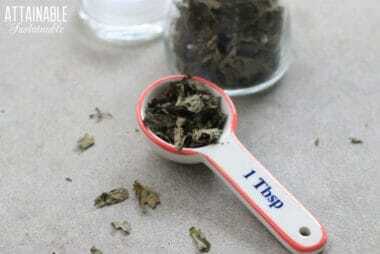 Before you start, make sure you have a container in which to put the peels. I use a 5-gallon bucket to tote the peels out to the compost when I'm done. Peel the bananas, collecting the peeled fruit into a large bowl. It will be fastest if you can peel them all at once. Slice the bananas 1/4" thick. Believe it or not, a mandoline works great for this. Place sliced bananas into a bowl or tray with lemon juice. Toss the sliced bananas in the juice. Once your dehydrator is full, or you've sliced all the bananas you'll be drying, turn it on to 135 degrees Fahrenheit for 8-10 hours. This of course depends on your climate and humidity and dehydrator. Plan to be around to check them during those last couple of hours. It helps to have a lovely assistant. If you can wrangle someone into peeling the bananas while you slice, it will go much more quickly. Timing is important. 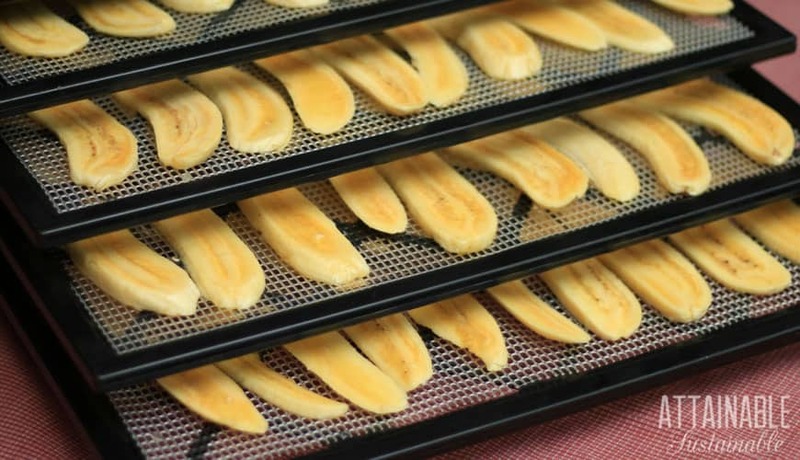 For chewy dried bananas, plan to turn the dehydrator on in the morning so the bananas can be put away that evening, or start them in the evening so they can dry overnight. You can let them go longer, absolutely, but they might be a bit more on the crispy side. I have a 9-tray Excalibur dehydrator. It takes about 35-40 pounds of bananas to fill it. Dehydrated, those bananas will fill a gallon jar or thereabouts. I’ve always wanted to make dehydrated bananas, and it seems easier to dehydrate them than other forms of fruit. Is there a way to do this without a dehydrator? Could I use my oven instead? I’ve tried making beef jerky in the oven and it came out okay. But, I disliked the amount of time I had to leave the oven running. It can be done in a low oven, yes. But there’s the expense of running an oven for hours at a time, then. Another alternative when the weather is good? You can do it in your CAR. (Really.) I would experiment with fruit before doing meat that way, though. 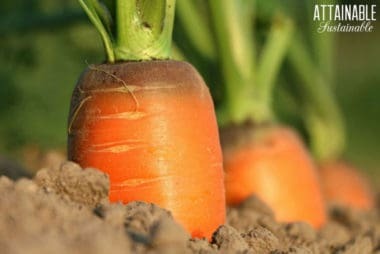 How do you do this with not having or affording a dehydrator? Can it be done in an oven? Okay, we live on the big island and we get tons of bananas from our “banana forest.” I tried drying them once and felt pretty happy with the results when they were done; however, they went bad pretty fast and our jars of dried fruit went moldy. I expect it has to do with the ambient moisture here. How do you store them? I am about to start another batch today since we have about a million bananas on my counter looking at me longingly. Maybe keep them in the fridge? Any other ways you use up all the bananas? I am, very unfortunately, allergic to the lovely bananas! How can that be? I don’t understand it at all. I have two big kids that currently eat bananas and it’s a lot of work for them to keep up. We had an easier time with an abundance of raspberries in our garden in Santa Cruz! Those never went bad! I am going to try the lemon juice too this time–I didn’t do that last time and it was fine, but maybe it might help on the preservation side of things. Just picked up a lot of Bananas and was wondering how they would dehydrate. So good timing! I am getting right to it. Good article. Thanks. These make a yummy snack and were easy to make. Aloha! 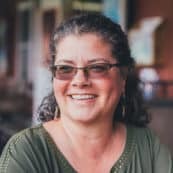 Mahalo for sharing your recipe, the only question I had was do you use anything on top the grate to lay the bananas on, parchment or wax paper etc? Had tried drying bananas on cookie cooling racks in the oven over a pan but they wanted to stick. Just bought a dehydrator and didn’t know if they would need any additional help to release Fromm the trays. The dehydrator I use (Excalibur) has bendy sheets of perforated plastic. The bananas peel off that pretty well. I think the flexibility in the sheets helps. I wouldn’t use wax paper or anything — that will prevent air from flowing. Is there an owner’s manual you can look at for suggestions? I prefer not to use Pam, but I imagine a light coating of olive oil could work, too. Hi Kris, just tried this and I have to tell you, these banana slices lasted less than a week. Don’t know how many pounds I started with but we went through them like nothing else. Don’t like the rock hard ones you get in the store but these are AWESOME! Glad to hear that! My family loves the m.
I have a dehydrator and will try dehydrating bananas. Do I dehydrate the bananas while green, slightly ripe or totally ripe? Eating raw green bananas don’t taste very good, so I would think dehydrated green ones would not taste good either. Thank you. Thanks for your nice article. Just wondering lemon juice acts like a preservative or serves some other function. 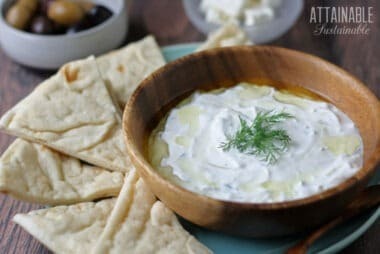 Will dipping it in honey serve the same purpose? Do all types of banana give similar results or are smaller ones I’ve better than the normal larger ones. I’ve used both full-sized and apple bananas; both work equally well. My dehydrator recipe book said to dehydrate bananas use a 1/2 cup honey and 1/4 cup water mixture. Dip the bananas, drain, and then dehydrate. I am currently doing them right now and I thought they would be a mess but they are not. I will let you know how they came out. How long do you leave them in lemon juice before placing on trays? Just while I’m slicing. Not long at all. I am currently making dehydrated bananas right now. The book that came with my dehydrator suggest using a honey/water mix so I used that. I want to make sure I dehydrate them enough without them going bad. It’s my first time. Should I go by the cooking time or look? I don’t know how they should look. I will let y’all know how they turned out with the honey/water mix. Dehydrating times are so variable, and dependent upon things like the humidity. I’d use both. They should feel dry to the touch, but still pliable. You can cut them in any direction you like. Is that what you mean?